Thank you everyone! This drawing came out of a 1993 issue of Rolling Stone. It's one of my favorite drawings I've done. Just wondering where did you get that picture of hetfield? awesome drawing!! I LOVE James Hetfield. Is this pic from a music video?? Whoa he looks pretty damn scary and intimidating... What band is he in Metellica? tiny and compressed quality. i'd like to see it bigger. good depiction though. 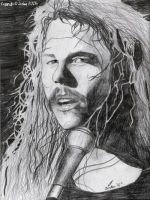 Hetfield when he looked awesome, cool drawing poppet. Thank you! I love your wallpaper art too. Especially the vampire one. Saddly the Vampire one is not mine but thank you for the rest.